VacMaster Sample Processing Manifolds allow up to 10 (VacMaster-10) or 20 (VacMaster-20) SPE or filtration columns to be processed simultaneously under vacuum. Unused ports are sealed when not required. Easy to use vacuum controls provide excellent sample flow control, leading to reproducible, reliable extraction conditions. The robust manifolds are constructed from high quality, inert materials, eliminating sample contamination, and allowing all common solvents and buffers to be used. Designed to match the requirements of individual applications, a variety of collection vessels can be accommodated by the fully adjustable racking system. PTFE stopcocks - push fit stopcocks provide individual flow control for each column. PTFE construction means smooth operation without sticking. Combined PTFE stopcock/needles - replace standard stainless steel needles with one-piece individual control units. 100% PTFE solvent path. 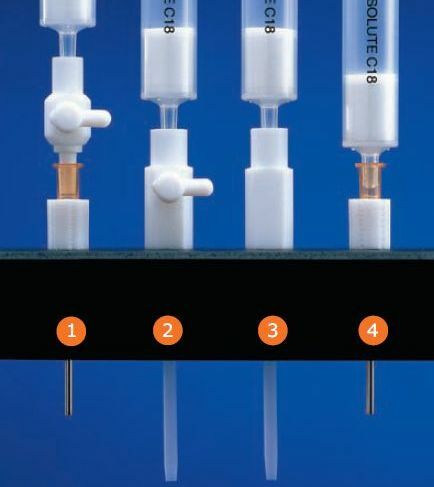 All needle and stopcock options are fully compatible with ISOLUTE SPE and filtration columns. Order VacMaster manifolds complete with racks (10, 12 or 16 mm diameter positions (plus 27 mm for VacMaster-10)) to accommodate a variety of collection vessels. Sample extracts are held securely by the height-adjustable 3 plate design. The carrying handle makes it easy to transport fully loaded racks. Lid also houses vacuum control arm including on/off valve, fine vacuum control and vacuum release valve.